OK, I have to admit it, the holiday cheer has affected me and after a suggestions from my wife I have decided to attempt a Santa 120 mm figure sculpt. The basic idea for this is a cartoon that I found on the internet depicting Santa stood by a fireplace. It looks very homely and in my humble opinion epitomises the feeling of Christmas. Not one to directly copy something if I can help it, I decided to make my Santa a little more traditional and have opted to go for the non-coca-cola red Santa (despite my wife's protestations). He will hopefully be depicted leaning on a fireplace with his sack of toys over his shoulder ready to disappear up the chimney onto his waiting sleigh. I have searched around a little on the internet and have not really found a non commercial figure sculpt of the big man, so I am quite happy that this is going to be something of an oddity in the figure sculpting world. As usual I have started the sculpt by first posing the copper wire frame in the rough position that it will be displayed in and then "fleshing" out the frame using sculpey. Once baked I will concentrate on the various areas of the body until satisfied with my work. As each section is completed, I bake to harden it before moving onto the next area. First up for this figure was the trousers. I had to take into account that this is going to be a more "fuller figured" sculpt and therefore bore this in mind with the thickness of the legs, size of the bum and girth of the stomach. The boots I have yet to decide upon so have opted to leave these for the moment. The photo on the left shows the figure with the first coat of sculpey and the rough pose which will eventually have the left arm leaning on an ornate fire surround while the right arm is laying upwards holding the neck of the sack which will eventually be mounted onto the rear of the body. The left leg is slightly raised to position it on the hearth of the fireplace which I also intend to build. The series of photographs below show the figure progress to date; the lower half of the trousers are to all intents and purposes complete with the upper halves yet to be finished. I have also added various layers onto the upper body to allow a build up for the generous size of the figure. You will probably have noticed that I have also started to flesh out the left arm slightly. It is a little difficult to envisage the fall of the cloth from the fireplace especially as I don't yet have a good idea of the final design of the jacket! 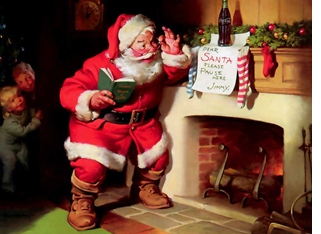 As I've said I want to move away from the Red Coca-Cola Santa and go a little further back to get closer to what the original Saint Nicholas would have worn (I am predominantly a historical modeller after all!!). With the basic shape of the figure now completed, I decided to turn my attention to some of the specific details of the figure. The first of which would be the face and the rest of the head. I had noticed that the position the head was placed in at the beginning of the sculpt was a little too far over to the left shoulder and would have left the head in an awkward position when completed. The head was therefore stripped back to the bare metal and re-baked to give a more realistic starting position. For the face sculpt, I realised that this was going to be a little easier than most sculpts as the majority of the face would be covered in a big bushy beard. The forehead, eye sockets, nose and mouth position were formed and once I was happy with these areas, the figure was again baked and left to cool. The beard is something that I have never sculpted before, but from watching a few videos on you tube, I had a general idea on how I was going to proceed. The first thing was to block out the areas of the face with some rolled out clay in the rough positions that the beard was to be formed. This was also done on the rear of the head as I intended to blend the beard and hair into the classic Father Christmas style. The next stage was to blend each of the portions of clay fixed to face into one another and then using the pairing tool that I have, removed any clay that look excessive. I then shaped the clay into a shape that resembled a suitable beard and moustache. You will have probably noticed from the above photos that the colour is a little bright and for want of a better word, commercial. This is the main reason why I chose the gloss colour that I have. This is a little bit of a pain for me as I usually prefer to paint oils onto a matt finish, so I will apply a matt varnish to the figure once the gloss paint has dried. You will also see from the photos below that work has progressed on the base that the sculpt will eventually be placed on. The complete build of the base is dealt with later on in this article. I have also added a photo of the only problem that I have encountered with this figure to date; the foot broke apart from handling in the figure vice that I use. It was an easy fix with some superglue but annoying none the less!! With the base coat complete it was now a simple case of breaking out the oil paints and highlighting/shading the detail onto the figure. I find that red is one of the most difficult colours to do this but on the whole I think that I achieved the effect that I was after. The following two shots show the figure in a virtually completed state, the remaining work will be carried out once it is mounted to the base. For the completed shots keep reading! Now that the figure is complete, I will turn my attention to the base that he will be mounted to. I envisioned Santa leaning on a fireplace, taking a short breather before disappearing back up the chimney to carry on with his good work. The logical step must of course be the fireplace that he is leaning on. To make life easy for me, I decided to make it out of balsa wood and fill in any gaps and dents, etc with some squadron green putty. The fluting on the fireplace is simply cut down tooth picks. Once completed and sanded down, I painted an initial coat of burnt umber acrylic paint to seal everything and identify any areas that would need more attention. I should also mention at this stage that I paid attention to the height of the fireplace as the pose of the figure relies on him resting his arm atop the mantle piece. The remaining part of the construction will be made from foam board, mainly because its lightweight, easy to use and best of all cheap!! The wallpaper is dolls house paper printed from a website that provides it free of charge to download including some Christmas wrapping paper which I will use for some presents later on. The following photos show a gradual build up of the wall, marble hearth (using the same marbling techniques as described in my Ezio sculpt) and carpet. The lit fireplace is constructed from dried wood bark and a wargames marker bought from @lemonpainting on twitter for a very reasonable £2. I hope that you have enjoyed reading about my festive sculpt and I would love to hear your thoughts. Have a wonderful Christmas and a prosperous and happy new year. Great blog post. :-) I love your Father Christmas. Beautiful work. Absolutely incredible work Craig! Huge fan! Merry Christmas!